These indulgent cakes with their tangy creamy icing would work well as a pretty pudding. Preheat the oven to 180°C/gas 4. Cream the butter and sugar together until fluffy. Beat in the bananas, eggs and vanilla. Sift in the cinnamon, flour, raising agents and a pinch of salt; fold in, then add the buttermilk. Divide into a 12-hole muffin tin; bake for 25 minutes until risen. Meanwhile, put the granulated sugar in a small pan with 75ml water. Heat until dissolved, then simmer until the mixture starts turning golden. Swirl the pan until the mixture is deep gold, then quickly add the cream and 1 tbsp water. It will bubble up but calm down quickly. Cool. Add the nuts. In another bowl, beat the cream cheese, sift in the icing sugar and mix. Chill. 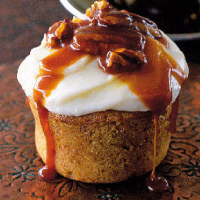 Top the cooled cakes with cream cheese icing and drizzle with the caramel and pecan sauce. The Corker recommends- A dark, luscious coffee is just what these cakes need.